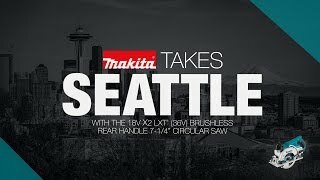 Makita, a pioneer in brushless motor technology and battery innovation, combines both in the 18V X2 LXT® (36V) Lithium-Ion Brushless Rear Handle 7-1/4” Circular Saw (XSR01Z, tool only, batteries and charger sold separately). It's powered by two 18V LXT® Lithium-Ion batteries for maximum performance, and has an electronically-controlled BL™ Brushless motor that matches torque and RPM to the application. Makita 18V X2 means freedom from the cord, even for demanding applications like cutting sheet and dimensional lumber that traditionally called for a corded saw. Best of all, users can remain in one battery platform, using the same fast-charging 18V batteries with the XSR01Z as they use across the expansive Makita 18V LXT® cordless tool series. Max. Cutting Capacity (at 90°) : 2-9/16"
Max. Cutting Capacity (at 53°) : 1-1/2"
Net Weight (with battery) : 12.4 lbs. Shipping Weight : 12.9 lbs.